To the average small business owner SEO is a dark, baffling, process impossible to understand. Here is post explaining 3 SEO tools anyone can use to improve their blog performance. Sure, you know you should be doing it and that it’s important. Yet the whole idea behind having a business blog is to help your site’s SEO. What’s the point if you’re not leveraging your blog to increase your sites rankings? Most small business owners can’t afford to hire experts or full-time webmasters to handle their sites SEO. The good news is that even the most clueless business owner can start increasing their SEO with a tool that guide you through the process. And you don’t have to be a tech wizard to use them. Although Serpstat is a multi-use SEO tool, one of the best features for business blogging is the Search Suggestions feature. It helps you create helpful content for your blog that your readers will easy find and value. 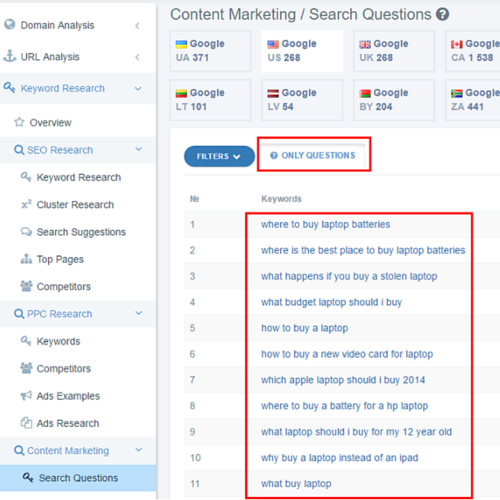 With a simple keyword like “buy laptop” you can see what questions people are Googling. For example, “why buy a laptop instead of an iPad” is asked by a large number of users. You could easily create a relevant blog post answering that exact question. This tool not only helps you improve your SEO but also your brand’s overall image. You’ll be seen as helpful and valuable, and as a credible authority figure in your industry. The numbers behind SEO can be complex. Moz has an awesome toolbar that shows a few key stats from your website. For example, PA is your individual page authority and DA is your domain authority. Both are calculated by several website factors including follow/no-follow links and Google rankings. There is both a free and premium version of the Moz Toolbar for both Chrome and FireFox. Moz also has great instructions and best-practice articles that will help you understand and improve your website’s statistics in a very easy way. It’s a great option for new business owners who want to try something easy that’s also useful. While this isn’t a traditional SEO tool, Google Trends is the go-to place to understand exactly what’s hot right this minute. Since Google is the most popular search engine in the world, we can easily see what Google users are searching for. You can search by country or categories including business, tech, health, entertainment and top stories. You can also see the exact keywords people are using, interest by subregion (on a handy map), the interest over time, and also related searches. This information can help you create relevant content for your site. For example, let’s say you have a pet-related business blog. The search term World’s Ugliest Dog Contest‬‬ is trending today and this could inspire a post that relates to this topic. 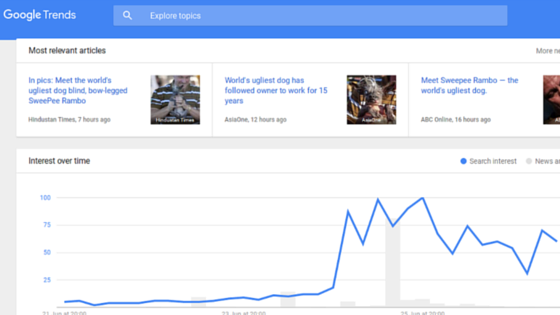 Of course, you still have to create valuable and relevant content, but Google Trends gives you an idea of exactly what people want to read today. Stop putting SEO on the back burner. There’s help for clueless business blogger – it just takes a little patience and practice. There are lots of simple, easy and affordable tools that allow you to ease your way into SEO. You’re already creating content for your business’s blog, so why not take a little time to create better content that will help your site’s Google rankings? Are Brain Damage & Multitasking Linked?